We did it. We finally did it! We painted our kitchen wall in chalkboard paint. We went back and forth for months on if we should actually do it or not, weighing the pros and most certainly the cons (it's a trend! it will make the kitchen too dark! chalkboard walls were so 5 years ago!) over and over again. We even asked you guys what you thought about it on an Instagram story, with most of you saying no ;). But then we thought, what if we just tried it? That's the great thing about paint, if you don't like it you can change it in a day, even if it takes you a few coats. In the end, we are so happy we made the jump and just did it. It makes the kitchen fun and, as our friend Anne said, it says we don't take ourselves too seriously. Thomas' mom has a huge chalkboard wall in her kitchen and over the years friends and family have filled it with their signatures and loving messages. You may have seen it in a few of our pictures from time to time. 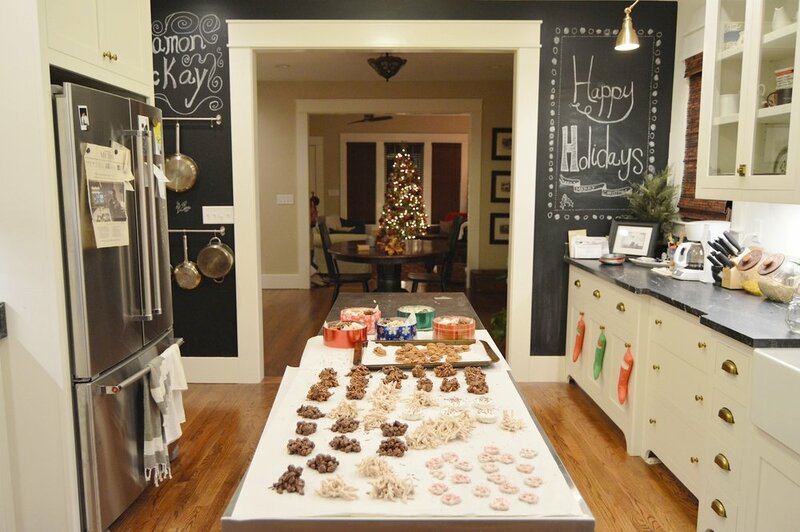 Are chalkboard walls a trend? Probably. We tend to stay away from trends, but there is something so homey and inviting about a chalkboard wall, don't you think? And we love the industrial feel it gives our kitchen with the pots hanging up against it. It may not last forever, but for now we are glad we went with it. Follow your gut despite what anyone else says. It's your home, after all. There are no "rules" so we've always said do what you feel happy and right about doing and nothing else matters. We have a YouTube video coming out soon about the actual process of painting it and some tips for you if you want to do your own chalkboard wall, so stay tuned! Also, pictured above are some sweet, no-bake treats we made last night. There may or may not be a YouTube video about those coming out even sooner ;).